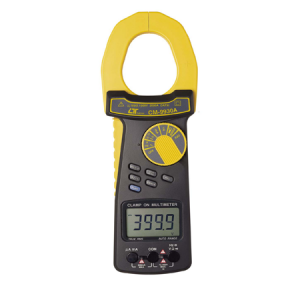 FEATURES * 2 in 1, 2000 A clamp meter + Digital multimeter. * Meet IEC 1010 CATIII 1000V safety requirement. * True rms reading for ACV & ACA measurement. * 4000 counts, Auto range, multi-functions for ACA, DCA, ACV, DCV, Ohms, Capacitance, Hz, Diode, Duty cycle and continuity check. * LSI circuit provides high reliability and durability. * Wide ranges ( 2000A, 400 A ) clamp on current measurement both for ACA & DCA. * 4 ranges ( 400 uA, 4000 uA, 40 mA, 400 mA ) direct current input measurement both for ACA & DCA. * Overload protection circuit is provided for all ranges. * Data hold, Relative key, Back light. FEATURES * Heavy duty, CATIII-600V. * Fork current probe both for ACA and DCA. * ACA ( 200 A x 0.1 A ), DCA ( 200 A x 0.1 A ). * DCV, ACV, ohms, Continuity beeper. * True RMS. * Data hold, Peak hold, DCA zero. * Hall effect sensor for no contact current measurement. * DC 9V battery ( 006P ). FEATURES * High precision AC mA measurement, it is useful for AC mA leakage current measurement. * Measure AC mA on the inductive conductor. * Miniature type, easy to carry out & operation. * High precision for low ACA leakage current measurement. * Built-in DATA HOLD function. * Crystal time base, high quality. * LCD display allows clear readout-out even at high ambient light level. * LSI circuit provides high reliability and durability. * Overload protection circuit is provided for all range. * Design to meet IEC 1010 safety requirement. * Compact, light weight and excellent operation. FEATURES * Watt ( true power ), ACV, DCV, ACA, OHMS, Diode. * Watt measurement via the inductive clamp jaw. * Wide range for power measurement, max. value up to 10,000 watt. * Design meet IEC 1010 safety requirement. * Heavy duty ACA clamp meter, 600 A max. range. * Compact & heavy duty ABS housing plastic case. * Measure AC current by the inductive conductor. * LSI circuit provides high reliability and durability. * LCD display, clear readout * Overload protection circuit is provided for all range.